Thomas Stearns Eliot was born in St Louis, Missouri, and educated at Harvard, the Sorbonne, and Merton College, Oxford. He lived in England from 1915 and became a British subject (and member of the Church of England) in 1927. He taught at Highgate School during the First World War and worked for Lloyds Bank from 1917 until 1925, when he became a director of the publishing firm of Faber and Gwyer. His first volumes of verse, Prufrock and Other Observations (1917), followed by Poems (1919) and The Waste Land (1922), made him a leader of the literary avant-garde. From an awareness of the fragmented, rootless nature of modern culture, expressed in the poems of this period, Eliot moved towards the High Anglican faith reflected in ‘Journey of the Magi’ (1927), ‘Ash Wednesday’ (1930), and Four Quartets (‘Burnt Norton’, 1936, ‘East Coker’, 1940, ‘The Dry Salvages’, 1941, ‘Little Gidding’, 1942, published together in New York, 1943). Of his verse plays, Murder in the Cathedral (1935), which dramatised the martyrdom of St Thomas Becket and was written to be performed in Canterbury Cathedral, is the most successful. As a critic Eliot helped to revive appreciation of seventeenth-century poetry. 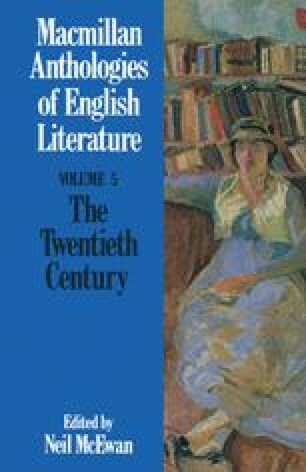 The Sacred Wood: Essays on Poetry and Criticism (1920) and Notes Towards the Definition of Culture (1948) were especially influential in the teaching of English literature, despite the conservatism behind Eliot’s emphasis on literary tradition.